1 - This allows one to download the client program to be installed in any user’s desktop or laptop. The client program allows the user to access the work environment of CIFKM he has been assigned and to use any functionality he has been permitted. The client program is downloaded, installed and automatically updated in the workstation when one accesses the server. The user doesn't have to worry about the updates. 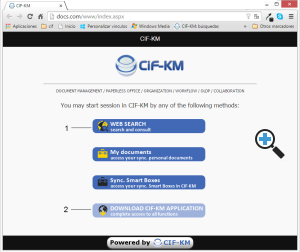 2 - This allows one to access the Web application of CIFKM with any Web-browser. It has been prepared for smartphones and tablets. 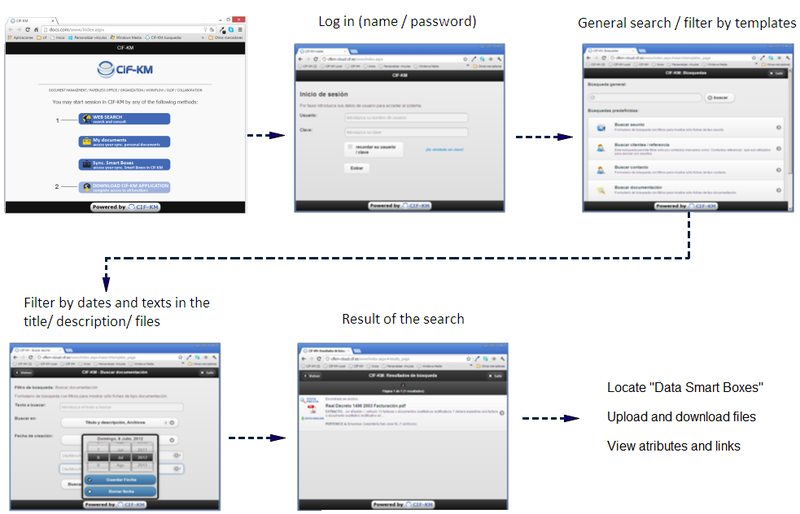 This Web application allows one to search for "Smart Boxes" contents, consult their information, create folders, and upload and download files of any kind. 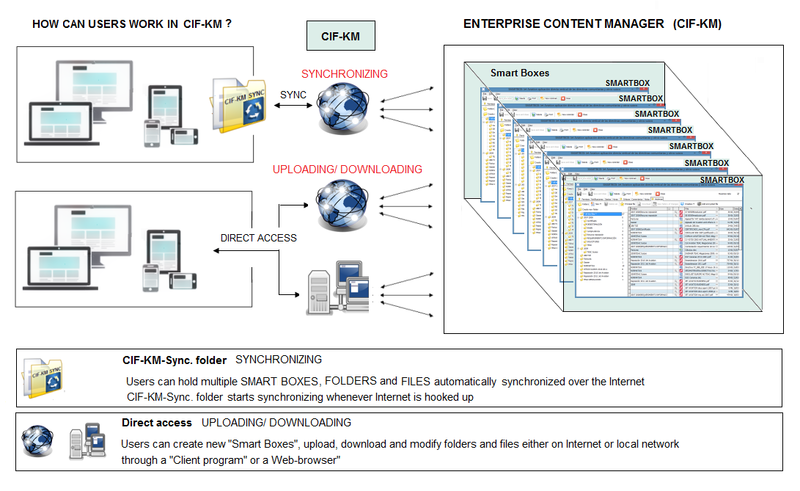 Each user can act according to his permissions over each" Smart Box " as with the client program, but the functionalities here are more restricted. 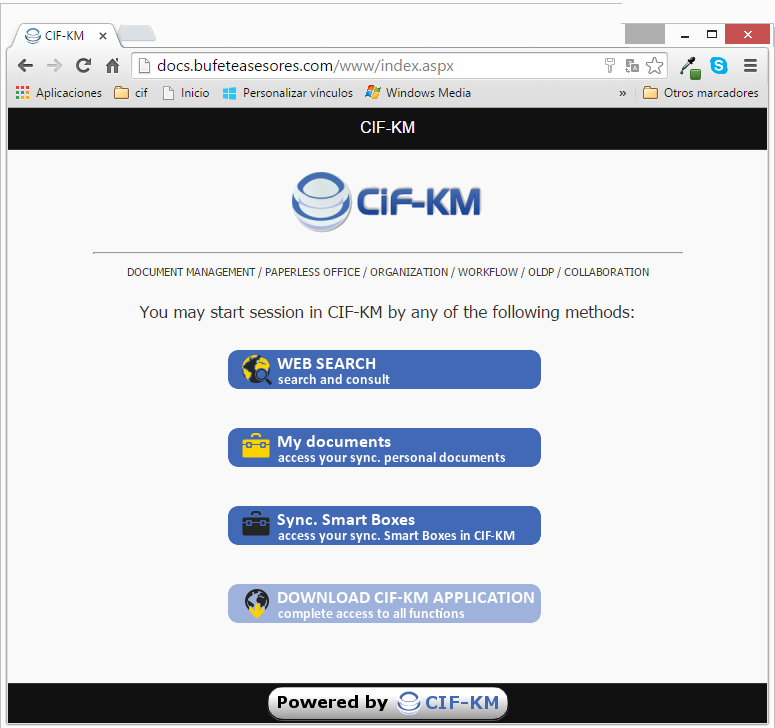 The CIFKM client program connects to servers using Web services. Therefore, the user of client program can access the CIFKM server from both the local network or the Internet.. If there is a good conection, the user will hardly notice the difference. For him everything is transparent. Internal users will commonly use the client program since it allows one to execute any functionality and faculty one has been assigned. 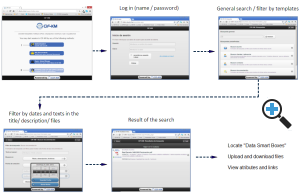 The user, identifying himself with name and password, may access his CIFKM environment from any computer with the client program installed. Also, if he uses a local network he may be automatically identified through the domain or the LDAP of his company. Development of the Web-browser application has been carried out with mobile devices in mind so as to make it easy for the user to select and scroll in a small touch sensitive screen.